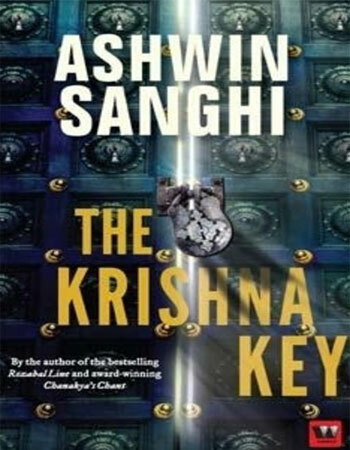 Blogadda was giving away 200 copies of a book named The Krishna Key! This is how I came to know about the book. I read the synopsis and I loved it. I vowed within that I will buy the book and read if Blogadda doesn’t select me. But, as always, they did not disappoint me. Last Saturday, I got hold of the book… Thank you Blogadda for giving the opportunity to review the book. In this heart-stopping tale, the arrival of a murderer who executes his gruesome and brilliantly thought-out schemes in the name of God is the first clue to a sinister conspiracy to expose an ancient secret—Krishna’s priceless legacy to mankind. Historian Ravi Mohan Saini must breathlessly dash from the submerged remains of Dwarka and the mysterious lingam of Somnath to the icy heights of Mount Kailash, in a quest to discover the cryptic location of Krishna’s most prized possession. From the sand-washed ruins of Kalibangan to a Vrindavan temple destroyed by Aurangzeb, Saini must also delve into antiquity to prevent a gross miscarriage of justice. Ashwin is an entrepreneur by profession but writing historical fiction in the thriller genre is his passion and hobby. Ashwin was educated at Cathedral & John Connon School, Mumbai, and St. Xavier’s College, Mumbai. He holds a masters degree from Yale and is working towards a Ph.D. in Creative Writing. Ashwin lives in Mumbai with his wife, Anushika, and his son, Raghuvir. He brings you yet another exhaustively researched whopper of a plot, while providing an incredible alternative interpretation of the Vedic Age that will be relished by conspiracy buffs and thriller-addicts alike. Are you feeling like the plot would bore you? Are you thinking that the book would not be promising enough? Do you think that the concepts discussed would be too complex to understand? Are you wondering what is the point in dwelling into an Epic called Mahabharatha and a mythological or should I say mythical character called Krishna? I say… Don’t let your perceptions eat you… After all, I felt great reading the book. To begin with, the synopsis intrigued me. After all, I am one among scores of others who have grown up listening to the stories of Lord Krishna. My mother used to narrate how naughty Krishna was as a child. The stories of Krishna stealing butter… Killing Poothana and Kamsa… Giving moksha to many… were always a part of my childhood days. As a child I was fascinated by these stories... I don’t know why... But even today Lord Krishna comes in my mind more as a friend than as the omnipotent… May be because I have a strange feeling that I grew up with him! So, as the story started with the narrative of Mahabharatha from the point of view of Lord Krishna, I felt elated! I particularly liked the way author has given a brief account of the Mahabharatha. Readers like me who have grown up listening to such stories would feel nostalgic… And all others would get to know about it at least now… As they say, better late than never! The references made to Vedas and puranas are brilliant. They bring goosebumps at times. At times, you wish that all those invasions into India did not happen. India would have gleamed in glory in that case. The book takes us through the richness of Indian literature and the pinnacle of proficiency of ancient people and sages. The narrative is steadfast and the flow is commendable. Though the book is filled with too much of information we will not feel like we have had enough. Instead, we would feel like we want to know more. In that way, the author strikes a chord with the readers. And hey! A double thumbs up for all the twists in the tale. That makes the book even more interesting. Why grab The Krishna Key? Come on, it is a book written by an Indian author… And thank heavens! It is not yet another love story. This is a serious book and talks about serious things. You will feel nostalgic at times. At times, you feel bad for not noticing the apparent. Sometimes, you feel as if you know so much about Vedas and puranas; but most of the time you would realize that what you know is as less as a droplet! I have been waiting to read this book for long ... will surely try to get a copy now !!! A very good book it is!!! Seeing your comment... I think I will read them! !